The picture book with culinary flavour won the inaugural Books&Seeds Award. This award is devoted to books dealing with subjects such as agriculture, organic farming, biodiversity, food, hunger, abundance, nutrition, safety and cooking. This book is as high and tall as a building, like so many of the apartment blocks in the city. The book’s main character is a tenant who lives down in the cellar and finds a solution to solve the problem. He goes upstairs following a logical sequence and knocks on everyone’s doors, offering food together with a cooking project. Then a large round table and a huge cake in the oven suddenly colour the pages. Colour and conviviality stream out of the building flowing into other apartment blocks. Soon there is not enough space so people go out into the street and get lost in a community feasting in a street party. But was it all a dream? Or is the dream about to come true? The book masterfully narrates the value of food in social exchange, a positive story flanking the trend to build communities and live in a community. Its analytical description of the characters and their domestic settings offers a strong and convincing example. Food is a need that brings everyone together and becomes a shared opportunity for us all, like the cake that helps to find creative solutions in the search for happiness. Empty Fridge will be exhibited at the Biblioteca Salaborsa, in the heart of Bologna, during the Fair and then in Expo Milan 2015, as part of the Biodiversity Park. 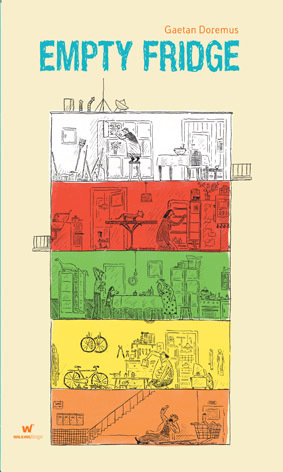 Our congratulations must go to Seuil Jeunesse, which published the original French edition of Empty Fridge, entitled Frigo Vide.